Many of those who have had a strange happening occur in their life are uncertain if their experience was truly odd or if other people have been reporting similar events happening to them as well? I know the number of strange creatures being seen all over the world is growing yearly. I do not think people all over the globe are making up stories of odd looking beasts or creatures. I think people all over the earth are seeing things they do not understand and have been reporting them more openly. I often receive emails and phone calls from people who tell me about the odd things they have seen. One of my readers wrote to me about a frightening experience that happened to him somewhere in the Idaho wilderness while on a camping trip. It seems the man and his friend were hiking on the trails around the camping site where they were staying when they became disoriented and became lost in the woods. The two men took a wrong path and ended up miles away from their campsite. They knew enough to find and stay on the hiking trail but were stranded in the woods for the night. The two men set up a make shift campsite right on the trail for the night. They started a fire however they were without any extra clothing or sleeping gear. The two men sat close to the fire trying to rest until morning. 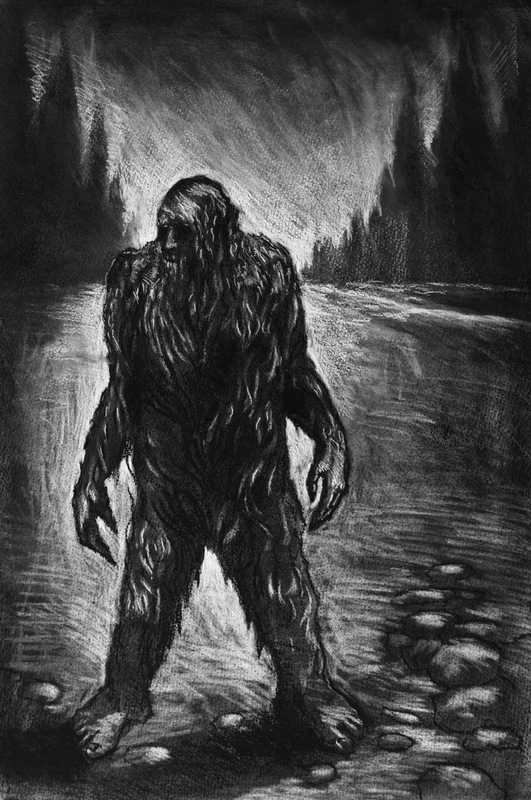 The one man laid close to the fire on his side facing the woods he noticed what looked like glowing yellow eyes peering at him from the wooded area next to the trail. He asked his friend to look at the strange set of eyes. As his friend turned towards the eyes they closed or moved or disappeared. His friend only got a very quick glance at them . His friend thought they may be fire fly's . The man knew that fire fly's were not native to the area. He also recalled his father telling him that fire fly's flickered on and off and were green. What he saw were clearly two slanted large yellow glowing eyes. The man felt he was being watched all night and knew that the eyes looking at him were not the typical thing one sees at night in the camping park. As soon as day break arrived the two searched the area next to the trail where they saw the eyes the night before watching them. They found broken twigs and three huge impressions of large foot pprints around the tree they thought was closet to where they spotted the watching eyes. The men quickly found their way back to the regular camp site. They told the others at the campsite of the eyes however no one at the campsite had any idea what they may have encountered. The men ended the camping trip and never returned to that camping area again. I have no idea what animal could have been watching them from the wood side that would be large and have yellow slanted glowing eyes. I think the two men may have been lucky that night as the creature watching them seemed to want to keep a distance between them. That is not the case however in this next report.